Berks Eye Physicians and Surgeons believes that LASIK is an extremely rewarding procedure with life changing benefits. But if you’re not as familiar with the ins and outs of the procedure, you might be on the fence about having it. Read on as we share the top five reasons to consider LASIK. Realizing you can see better than you ever have before without visual aids is a tremendous gift. It is incredibly freeing to be able to wake up and go about your day without worrying about putting in contacts or finding your glasses. There are so many more simple pleasures, like falling asleep whenever you want without taking out your contact lenses, that you can enjoy, thanks to LASIK. In certain occupations, wearing glasses or contact lenses can be irksome or even interfere with tasks. For example, if you’re a health care professional or first responder, you know that time is of the essence. You don’t have time to bother with glasses that fog up or the possibility of something getting on or under a contact lens when every minute matters. Having LASIK eliminates concerns about these interferences and provides crystal clear vision all the time. 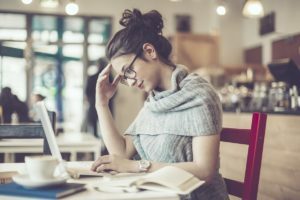 Even if you work in an office on a computer, wearing glasses or contacts can be inconvenient; glasses cause glare and contacts can dry out your eyes. LASIK eliminates these obstacles and makes you more comfortable (and possibly even more productive!) at work. Another reason to have LASIK right now is to eliminate the repeated costs associated with glasses and contact lenses. If you add up how much money you spend on glasses and/or contacts, cleaning products, appointments to adjust your prescription and other related costs, you can understand how LASIK is a fantastic financial investment. One of the best parts about LASIK is the instant (or near instant) gratification. After a short procedure, which takes about 10 minutes per eye, you will quickly be able to see clearly without glasses or contacts. The downtime is very minimal and serious side effects are rare. Thanks to breakthrough LASIK technology, there’s no better time to undergo laser eye surgery than the present. We use Wavescan technology to determine the minute imperfections of your eyes and vision and use this information to create a special map that drives the laser treatment. We perform LASIK bladelessly, using a combination of femtosecond and excimer lasers, for more precise and accurate visual outcomes. If you would like to discuss LASIK in more detail with our team, please contact Berks Eye Physicians and Surgeons today.